Las Ventanas is one of the most luxurious resorts in Mexico, and we absolutely love photographing destination weddings at this spectacular property. The name of the resort translates to The Windows to Paradise. And no wonder! From every villa, there are stunning ocean views and a telescope to watch the whales during the day and count the stars at night. Las Ventanas has two beautiful options for your wedding ceremony: The Beach or La Plaza. At the Beach, couples can enjoy the white sandy shoreline and the sound of ocean waves as they say their vows on a private beach. If you prefer to enjoy the beach and ocean views without getting your feet sandy, La Plaza is the perfect spot for your ceremony. The terrace has panoramic views of the ocean and the Baja coastline. On the tree at the centre of La Plaza hangs dozens of hand-blown glass hearts. Las Ventanas also has romantic private wine cellar, La Cava, which is a unique location for a small intimate rehearsal dinner. 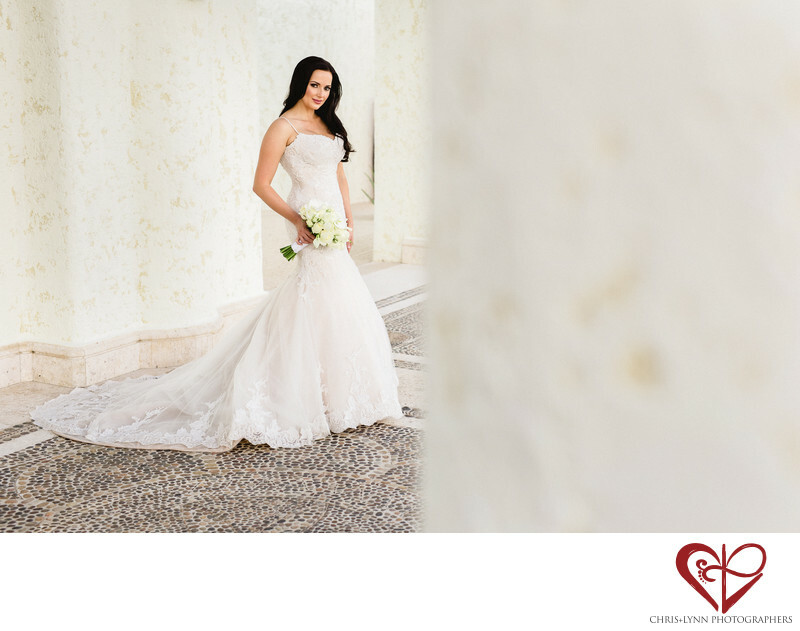 Las Ventanas has many beautiful locations for wedding photos. Unlike many Los Cabos resorts, it has many areas of open shade which offer soft and flattering lighting even in the middle of the day. The clean lines and white walls of the entry way is one of our favorite places for bridal photos. This image of the bride showcases her Pnina Tornai gown, her classic rose bouquet, and her beauty.